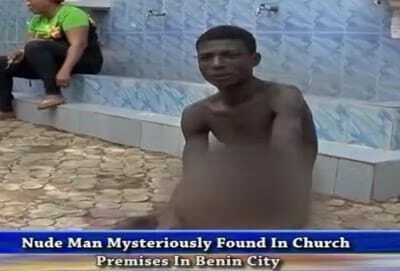 An unidentified young man was, yesterday, found roaming the compound of City Gate Church, Benin, the Edo State capital stark naked. The man later confessed to be flying above the church roof when an unknown power dragged him down. The church workers were left in shock when they opened the church gate to meet the naked man in the compound. They said in their testimony that they were all stunned because the church gate was locked the previous day, and the fence is very high and fortified with razor and sharp barbed wires. They claimed that there was no logical explanation for the naked man to roaming to and fro the compound. The naked young man confessed he was a wizard and had flew from Delta state. He said, “It was passed 10 pm in the night when the spirit led me and I started hearing a voice and I entered the here [the church] and discovered it was locked.